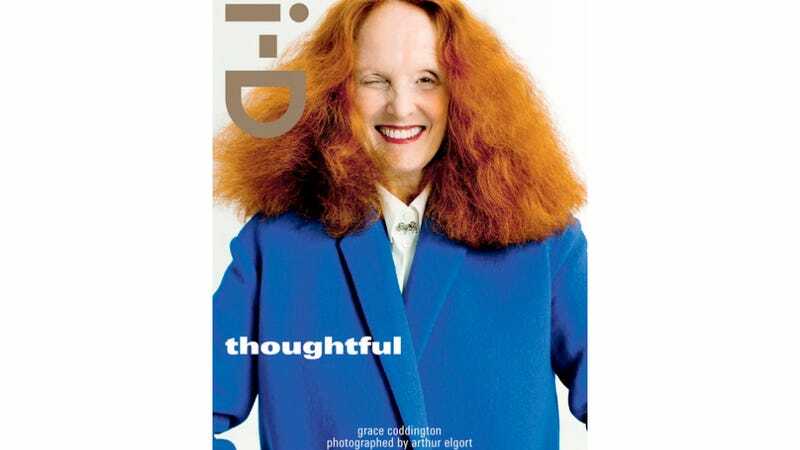 Grace Coddington says that young designers could stand to have "a few things going wrong in their life. I mean, I hate to say it, but it teaches you a hell of a lot, you know." Coddington continues, "I think they need time, and I think too many of the young designers really think that they can step right out of school and be a best seller, and that's a mistake," says Coddington. "I mean, you know, Nicolas [Ghesquière] took forever to get where he was. Marc [Jacobs] got fired 10 times before he made it." "They gave me media training. And I was a total failure. They were like, ‘Oh, can't say that, oh, you can't say that, and it's not politically correct to say that, and don't swear.' But I swear like a trooper." "Oh my God, I was nervous, of course I was. Because she and I are very entwined — and I was nervous that I had said too much about her, from her point of view. But I was also nervous that she would think it wasn't well written or not well laid out. But she wrote me a really long letter saying she loved it and that was a big relief. She trusts me. I don't have anything horrible to say about her anyway, and I know everyone out there is probably hoping I get really nasty about her. A) I wouldn't, and B) I don't have anything bad to say. She's my boss and you have to respect that she makes the magazine what it is, and we all contribute. Ultimately it's her show." "The portrait was nine months, seven days a week, from seven p.m. until two in the morning. I could not be one minute late. He was really powerful. You wanted to please him. But I wish I hadn't posed like that. It's just the first thing I did — I fell on the side of the sofa and he said, 'That's fine,' and started painting. It's not like modelling, where you can change it. I had a dead arm. Did you know I got tattooed by Lucian? He did it with an etching pen. It's a flock of birds. One night he said to me, 'I used to do tattoos in the navy, on the ship, I used to do all the sailors' tattoos.' And I said, 'Oh my God, that's amazing!' So he said, 'Would you like one?'" "I'm very happy with what happened, that the American [courts] recognized it was a valid trademark. It is a trademark, period. I felt a bit weird and quite betrayed and offended by the behavior of a group that has a lot of luxury brands. They should know what is luxury and actually protect that because they live out of luxury. Because it was a big group they were thinking I would not stand up for my identity and trademark, which proved they didn't know me that well. It was weird for me that they wouldn't see it as a double standard. I own a color in a very specific place on a very special object. With Gucci, they own the red-and-green stripe. How can they own that trademark and tell someone they can't own a color?" "Mila is such a nice girl and extremely down-to-earth. Everyone on Ashton's team is happy for them. She is very laidback and low maintenance. Her favorite coat is from H&M and she doesn't take herself too seriously." And now, a moment with Rei Kawakubo, the designer behind Comme des Garçons. Rei, what makes you happy? "The more people that are afraid when they see new creation, the happier I am."